Home › Utah › What Is ‘The Rock That Tells Stories’? Like a palimpsest manuscript, showing traces of ancient writing under the new, the rock reveals layers of messages. And each stratum takes us not only back in time, but across entire civilizations. 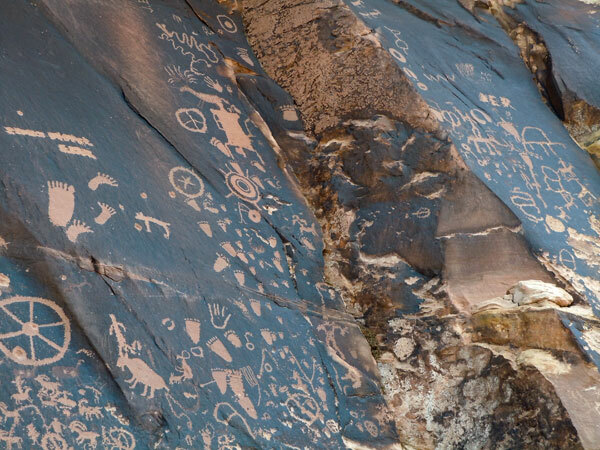 Newspaper Rock — known to the Navajo as tse hane, “rock that tells stories” — sits just a few strides away from Indian Creek in a shallow canyon in southeast Utah, a crossroads for the many cultures that have inhabited the Four Corners area. And each of them — no fewer than six different groups — have left their mark here. Together they’ve made this sandstone panel, image for image, the largest and densest display of rock art in the United States. It’s hard to date petroglyphs, because they’ve been pecked into the rock’s outer layer of natural varnish, rather than painted on. 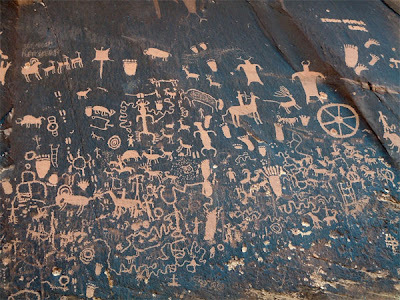 But judging by the style of the most faded animal images and abstract designs, the first people to inscribe their thoughts on Newspaper Rock were those known today only as the Archaic, itinerant hunters and gatherers who first appeared in the area some 8,000 years ago. They probably left their marks here around the time that Jesus, Buddha and Mohammed walked the earth. More recently, the Fremont culture, prolific rock-artists who thrived in Utah and Nevada from 500 to 1300 CE, etched the bulky human frames you see with trapezoidal torsos, as well as some of the bighorn sheep, and probably many of the hand- and footprint shapes. More known for their architecture than their rock art, the Ancestral Puebloans were contemporaries of the Fremont and shared this small swath of the southwest with them. They also likely contributed some of the animal and human shapes. 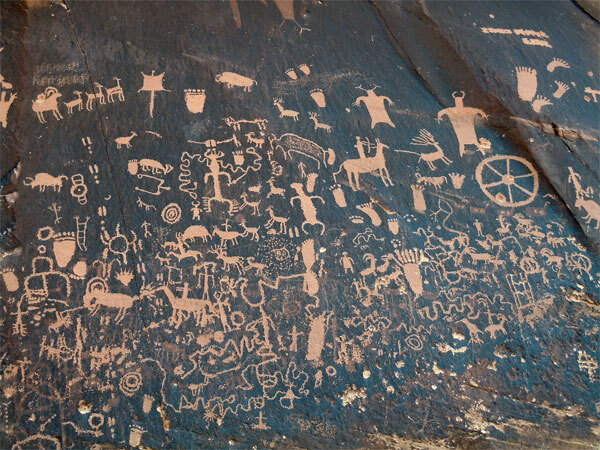 But the most obvious tell on Newspaper Rock is the depiction of a man hunting on horseback — only possible after the Spanish brought horses to New Mexico, and then briefly abandoned the colony in the 1680s. 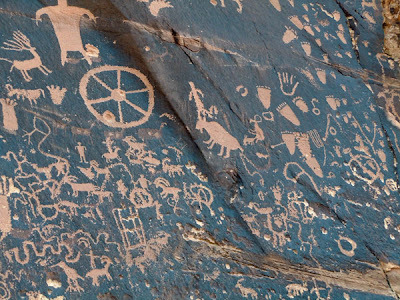 The horseman and other images like it — including warrior shields, a stirrup, and what appears to be a spoked wheel — date this part of the palimpsest to the region’s first occupants during historic times, the Utes and Navajo. The additions made by the Southwest’s most recent immigrants are arguably the least inspiring, if the easiest to decipher. On the upper left, there’s “J.P. Gonzalez 1902.” Just below it, “C. D. Gonsales 6/3/54.” And all around the margins of these ancient, ineffable images are initials and names — “Jean’ with the N written backwards, “JER” — that are probably no more than a few years old. There is, of course, a difference between vandalism and contributing to history. In fact, they’re opposites: Vandalism obscures history. And if it doesn’t tell a story, it’s just graffiti. I would suggest that these stories have been deciphered. … Carol Patterson is certainly the foremost interpreter of “rock art” in America. It is NOT art, it is written language. Carol’s studies have been independently proved, and the results are repeatable!